RETIRED AND LIVIN' THE LIFE! Fergie is our little ball of fire! Great drive and wants to retrieve. Pick up a ball and she will play forever. Fergie has produced 3 litters of wonderful puppies. She is a retired finished dog and is owned by D&S. 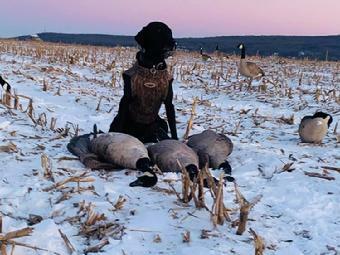 Ziva is a well-bred black female who came to us from Ed Myers at Churn Creek Retrievers in Worton, MD. Ziva is a marking machine and runs blinds flawlessly. Ziva has produced 4 litters of wonderful puppies. 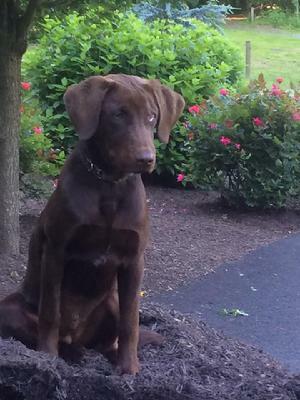 She is a retired finished dog and currently resides in the hunting home of Cori Stephens in Oley, PA.
Koko is a 55 pound chocolate female who we bought as a puppy from Blue Ridge Retrievers. She loves to retrieve and is a ball of fire! 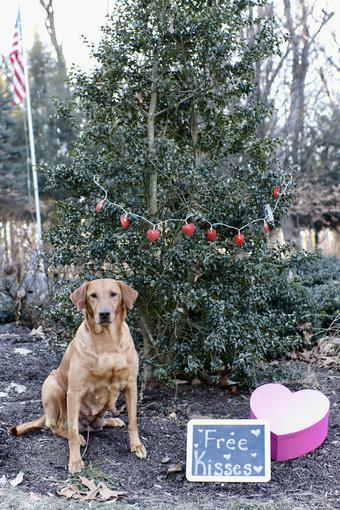 In May of 2010, Koko joined American K-9 Interdiction (AK9I) which is a service disabled, veteran owned business, with its corporate offices and training facilities in Southeastern Virginia. AK9I produces and trains superior working dogs for government, law enforcement and private entities. AK9I specializes in training canines and handlers for policing/patrol assignments, narcotics detection, explosive detection on and off leash, tracking/trailing and specialty disciplines. 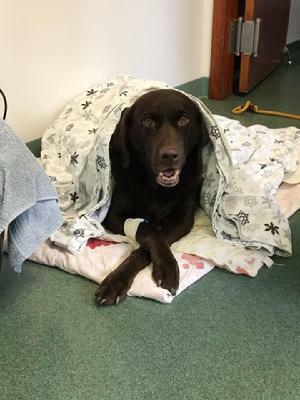 Koko was diagnosed with a thyroid problem which meant she wouldn't be adopted by any of the services units, but she became their demonstration dog and excelled at what she did. 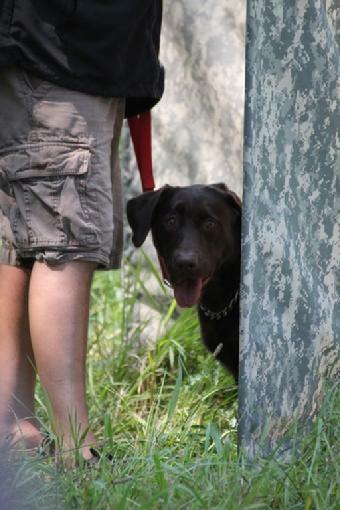 We acquired Koko back from AK9I when she was finished with her duties there in September 2013. 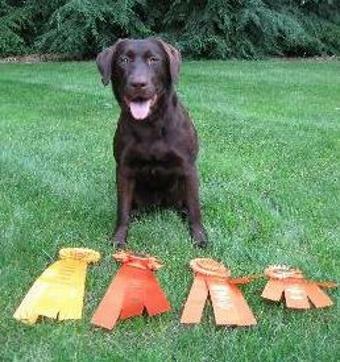 Koko is owned by Sara Wright and livin' the good life of swimming in ponds and playing with her chocolate brother Kuda. 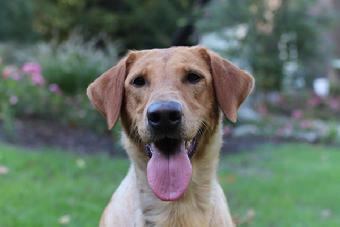 Ellie weighs about 70lbs and is one sweet girl! She is our "princess". 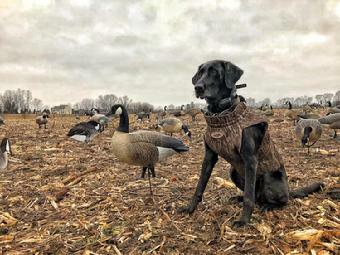 Ellie is capable of multiple marks and blinds and retrieves to hand. 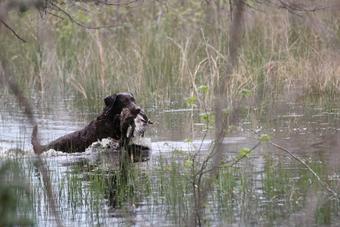 She works hard in the field, and then proves to be a wonderful companion in the home. 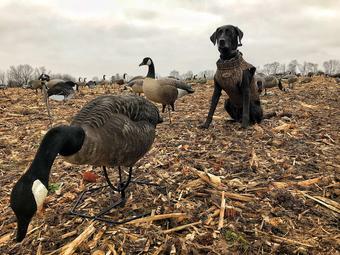 As of Fall 2016, Ellie is retired from breeding, and will become full-time hunting companion. 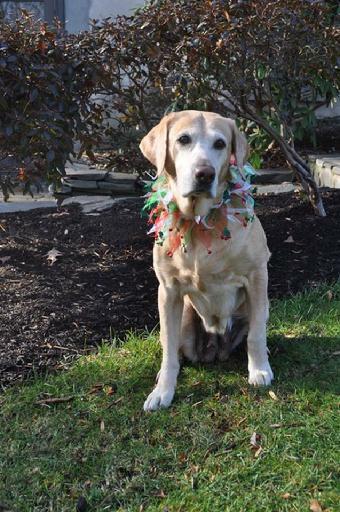 Ellie now lives with Tracie & Chris Heckman and enjoys her time spent at the family dairy farm with Reece and Katie. Vixen is a beautiful chocolate female that we had good intentions of raising and becoming part of our D & S breeding program. 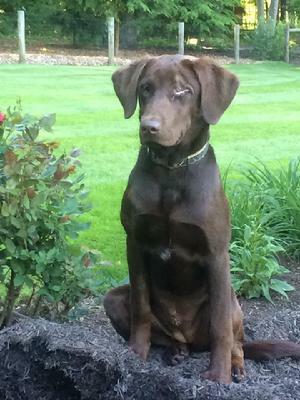 At about 5 months of age, Vixen developed an iris melanoma (tumor) in her left eye. Vixen had surgery to remove the eye and was spayed at the same time. 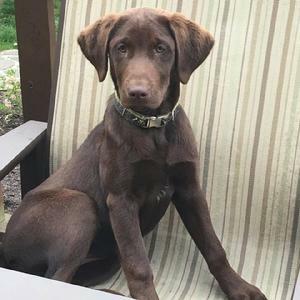 Vixen stayed in our family and now lives with Patty & Shawn Mengel in Breinigsville, PA. She is a smart little girl who loves her new home and comes to visit often. 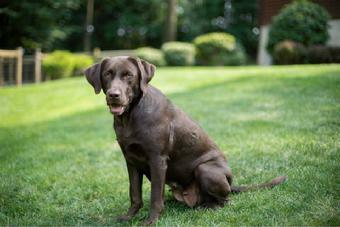 River is a 60 lb chocolate female who came to us from Cresthill Kennels in Woodford, Virginia. River is the sweetest, most easy going dog in our household. Throw a bird in front of her and she lights up with energy like you've never seen.